A few weeks ago I was contacted by a podcast viewer, Kim, who is a consultant for Steeped Tea. Steeped Tea is a company that works through its consultants and a party format to sell teas. Kim offered to send me some samples and a catalog to give it a try. I tried some of the samples and decided to place an order. One of the blends I ordered was the Monk’s Blend. 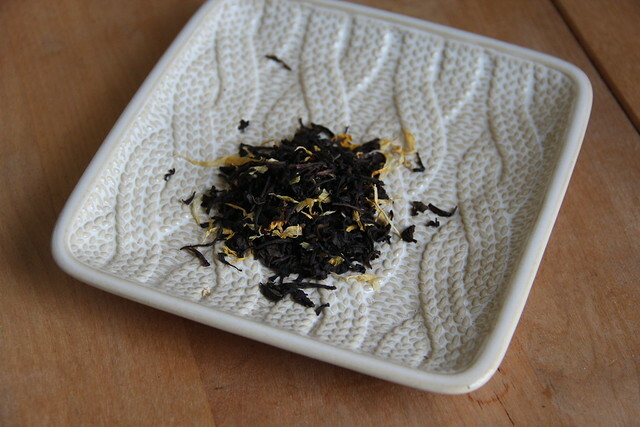 From the website, the blend contains black tea, calendula petals, sunflower petals and natural flavors. 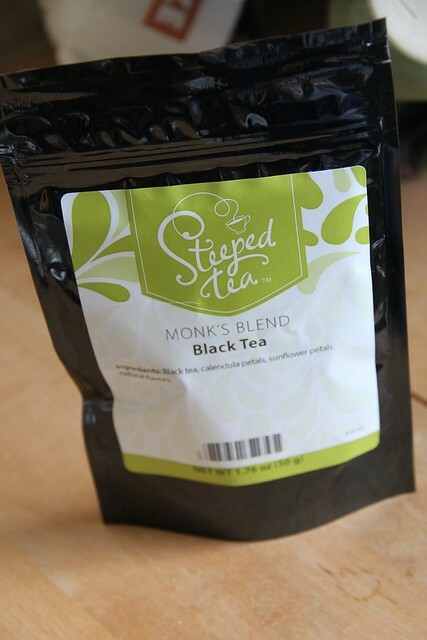 Monk’s Blend is available in 50g (1.76oz) increments for $7.50. When I opened the bag I smelled a sweet fruity flowery smell, almost like caramel. Once brewed the tea smelled more like black tea and less flowery. It tasted like a lighter black tea, with a definite hint of sweet flowers. It was a nice blend, I think it would be great in the afternoons with a sweet treat. If you’re interested in giving Steeped a try, you can find Kim’s party and the tea offerings here. And thanks to Kim for letting me try a cuppa! Next The Corner of Knit & Tea: Episode 80, I’ll speak plainly.